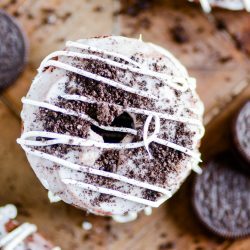 Moist chocolate donuts that are baked instead of fried, topped with a sweet glaze and Oreo crumbles. Happy Thursday! It’s almost the weekend, which I think calls for donuts!! I’m obsessed with donuts. Cream filled, chocolate frosted, sprinkled, glazed, baked, fried, whatever. If it’s a donut, I want it. 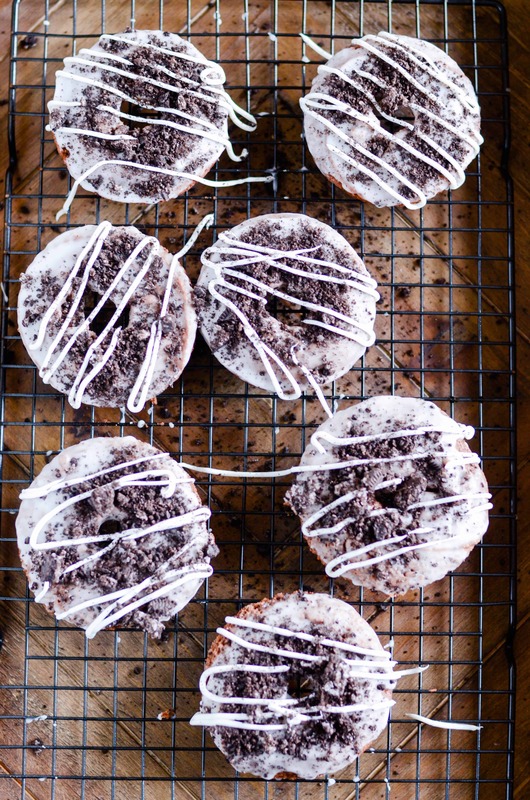 These baked chocolate donuts with a glaze have an especially soft spot in my heart. I love the texture– they’re a little bit crispy around the edges, just like a fried donut, but soft and airy on the inside. So much perfection in one little breakfast food! 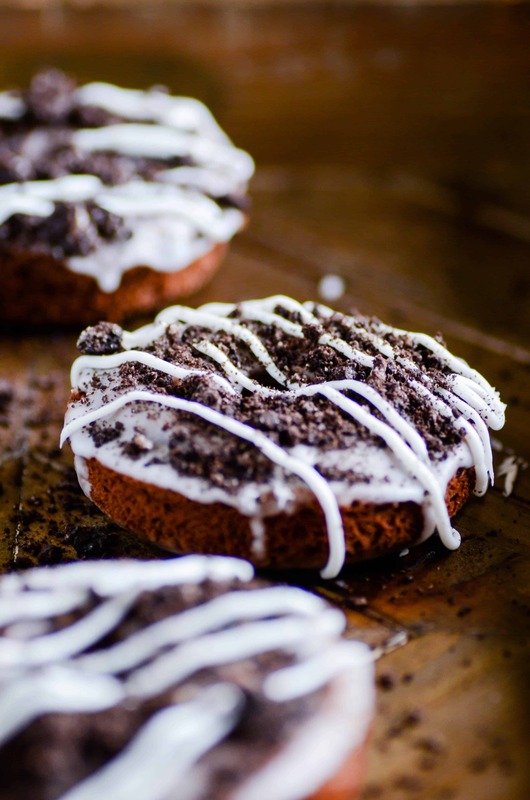 Today, I’m taking my favorite chocolate donut recipe, and cranking it up a notch by coating the glaze in Oreo cookie crumbles and adding a drizzle of cream cheese frosting to top it all off. 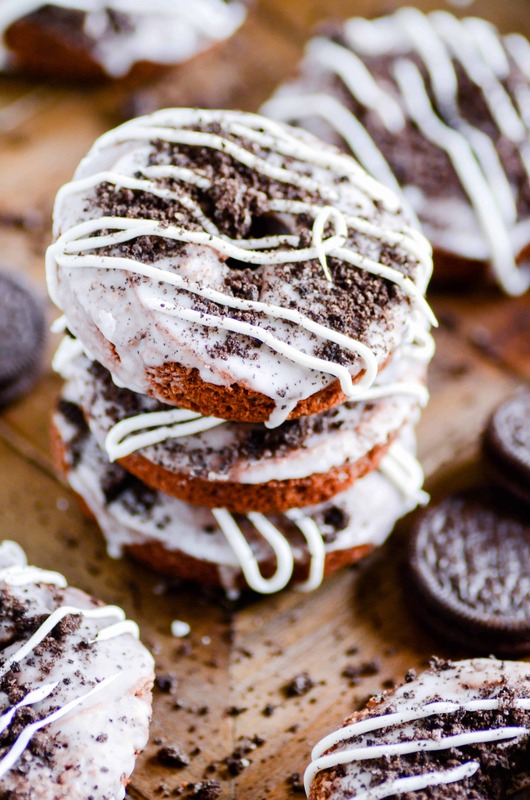 These donuts are incredibly simple to make. The ingredients are simple and straightforward, stuff you have on hand. And the mixing and baking process is a breeze as well. Basically, what I’m saying is that you can have homemade chocolate donuts in about 20 minutes. Which I think we can agree is something we allllllllll need. ???? Whisk together the flour, cocoa powder, corn starch, sugar, baking powder, and salt. Add the egg, milk, vanilla, and vegetable oil. Mix until smooth batter forms. Pour batter into a large piping bag (I usually use a gallon sized zip top bag). Generously and thoroughly grease a donut baking tin with nonstick cooking spray. Snip the corner of the bag and pipe the batter into the tins, filling each about 3/4 full. (My donut pan only bakes 6 donuts at a time, so I typically overfill each one just a bit or I have a little batter left over-- which I will sometimes use to make a few mini donuts in my mini pan). Bake for 7-8 minutes until toothpick inserted comes out clean. Let donuts cool in pan for about 10 minutes, until pan is cool enough to handle. Invert donuts onto a wire rack for complete cooling. Whisk together the powdered sugar and water until smooth. Spoon glaze over each donut. 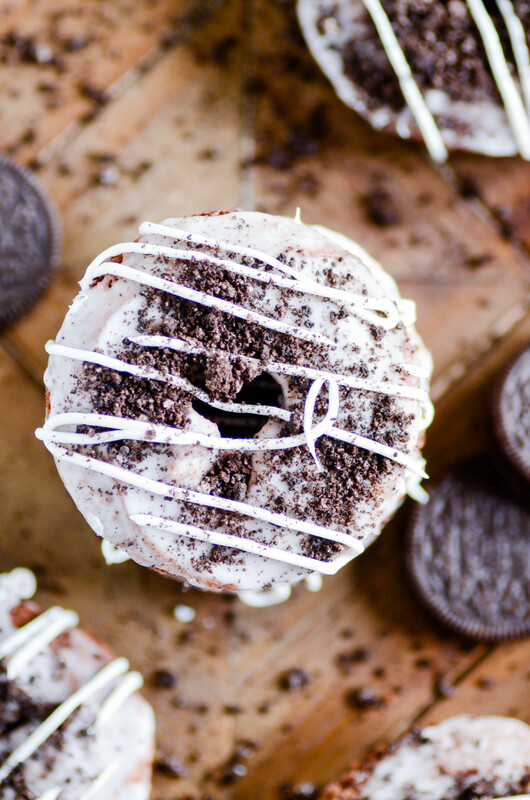 Sprinkle the Oreo crumbs* over each donut and drizzle with cream cheese frosting before serving. 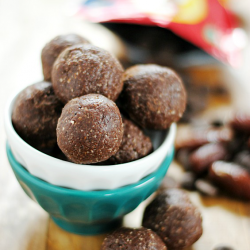 *Oreos absorb moisture and get stale QUICKLY (even when stored in an airtight container). 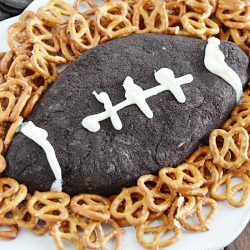 I don't recommend adding the Oreos until you are ready to serve.